Do you like Reality TV? 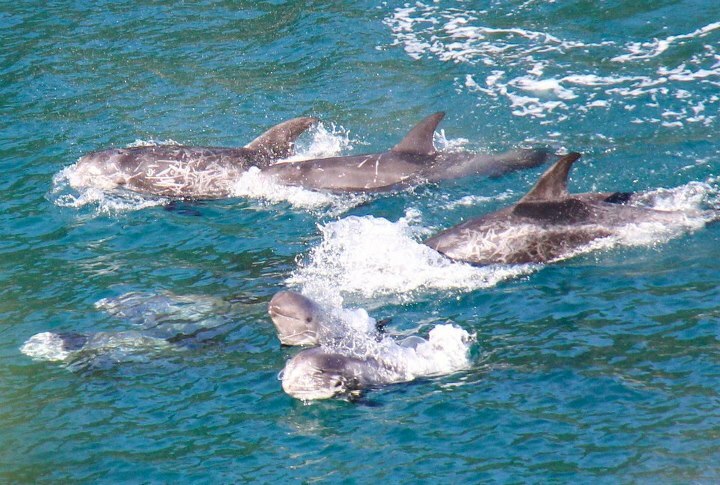 Well here is a real action packed episode that took place in Taiji Cove today. Who would you nominate for eviction from the area? In the early hours of today a battle was going on between a pod of Risso dolphins and the hunters near taiji Cove. These brave dolphins were chased relentlessy for over 5 hours and eventually part of the pod escaped and the rest were driven int the Cove. But this was not easily won by the fishermen. These dolphins fought and fought every second of the way but being chased for all of that time by hunters intent on catching them took its toll and they were eventually netted into the cove, with no escape. It is reported that 2 dolphins have been selected for the Taiji Dolphin Resort Trainers so are held placed in the harbour sea pens. 2 dolphins (one a young calf) and possibly the mother were concealed under tarpaulins and dumped back out to sea. We hope that they are still alive. 6 dolphins were slaughtered . There was no meat auction because the struggle and slaughter ended too late in the day. This is because the pod escaped when they were on the horizon but the hunters would not give in and went out to sea and rounded some of them up again. It really is heartbreaking as it unfolds and it is worse than watching any chase or horror movie because you know that it is real and happening now. This is why there will be a Rally Against the Dolphin/Whale Hunt in Tokyo on Saturday 24th November 2012. This is highly significant as it is the first of its kind in Japan. We wish them the ultimate success of getting this ubervicious hunt stopped as soon as possible. There will also be a demonstration oustide the Japanese Embassy in London on Friday 23rd November 2012 and people handing out leaflets about this brbaric practice on Saturday 24th November 2012. There is a petition that you can sign. These poor cetaceans cannot sign it or attend the demonstrations. Lend them your voice. This entry was posted in Animal Work, Dolphin, Taiji Cove and Related Information, Taiji Terror Tales and tagged animal welfare, Death, dolphin, japan, Taiji Cove and Related Information, whales. Bookmark the permalink.